Your new issue showed up the other day with the word “neoliberalism” in bold type on the cover. The continuing use of this term is not helpful. When I first saw this word a few years ago I wondered how the word “liberal” and “neoliberal” were connected? Then, I remembered the little I know about 19th century political philosophy. Oh, its that liberalism that is new! Really, outside of academic circles no one knows what this word means. Most in my circle find it offputting, obscure, or boring. I prefer to refer to this ideology as “free market religion”. “Free market” is a widely used term and “religion” gets across the fact that this is a counter-factual pile of BS. If you don’t like my term come up with something better. Please stop using “neoliberalism”. Mark, this is something that we struggle with, but we have over the years decided that it is more important to call our current economic system by the name that left economists have tended to use. You’re right that its origins are academic, but other mainstream publications have been using it more and more (for example, The Guardian, Salon, Jacobin, and (as far back as 1990) The American Prospect. Dollars & Sense authors have been using (and carefully defining) the term “neoliberalism” for years now (most recently in David Kotz’s two-part piece on the crisis of neoliberalism (here, but for years before that). We do try to explain the term whenever we use it. 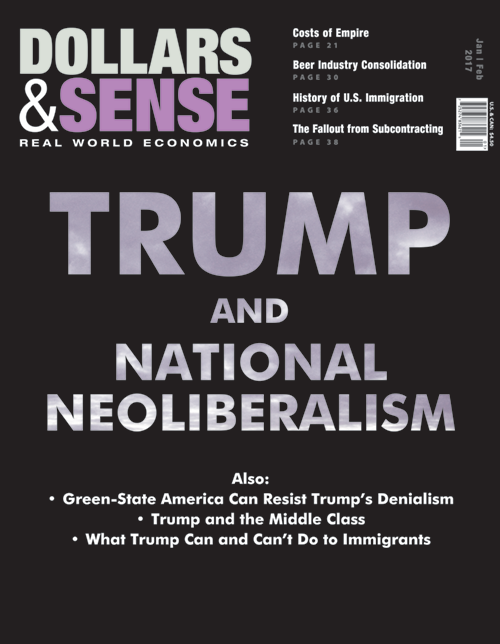 Sasha Breger Bush’s cover story makes a careful argument that Trump’s economic policies do not signal an end to the free-market, anti-government policies of the neoliberal era, but do signal the end to its globalist orientation. She’s proposing that if he gets his way we will be entering a different economic regime, and she gives it the name “national neoliberalism.” It’s a bold and thought-provoking analysis and we wanted to use her new term on the cover. We recognize the downsides, but we think our readers are familiar enough with the term and those who aren’t will read on to see what it means. Anyhow, you are surely right that it is offputting to some people, and that’s why we’ve struggled with whether to use the term. But we think the value of getting people familiar with the name of the economic system we’ve been living under outweighs the downsides of using the term. Your comment is a reminder that we need to do better about explaining what we (and left economists) mean by the term.